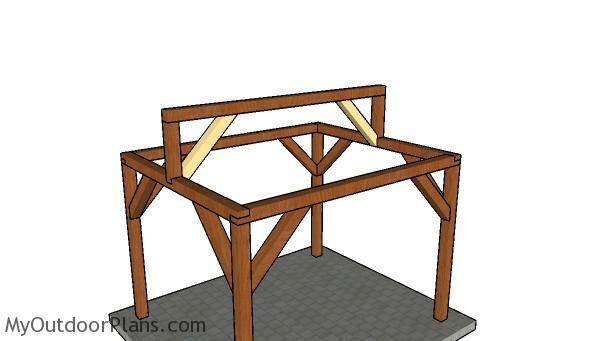 This step by step diy woodworking project is about a 10×12 outdoor pavilion plans. I had a request for a simple 10×12 pavilion, so I have come up with this design. Make sure you take a look over the local building codes, so you comply with the regulations. Take a look over the rest of our woodworking plans, if you want to get more building inspiration. 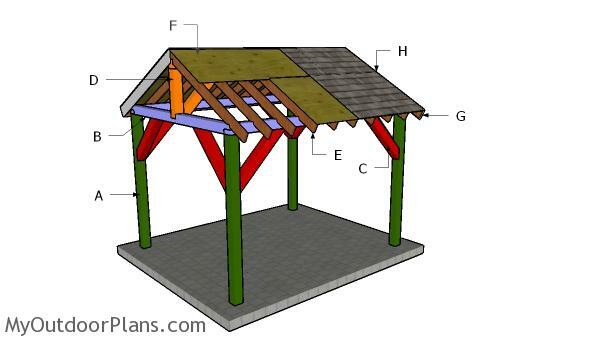 It’s that simple to build your own pavilion! 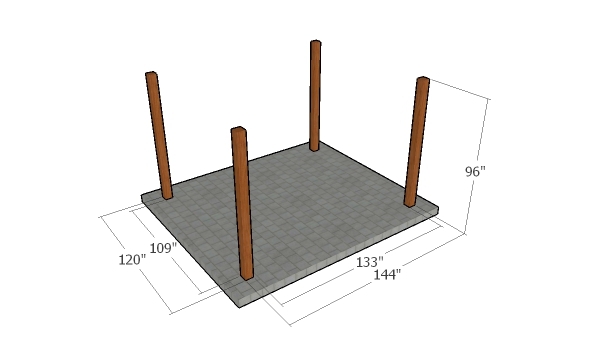 The first step of the project is to layout the posts for the 10×12 pavilion. 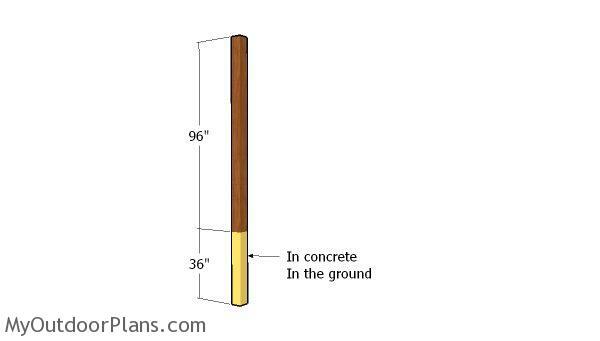 Use batter boards and string to determine the location of the posts. Apply the 3-4-5 rule to every corner of the pavilion, so you make sure they are right angled. Moreover measure the diagonals and make sure they are equal. Determining the location for the pavilion is essential, as you have to comply with the local building codes. Make sure the surface is level and remove the vegetation layer. 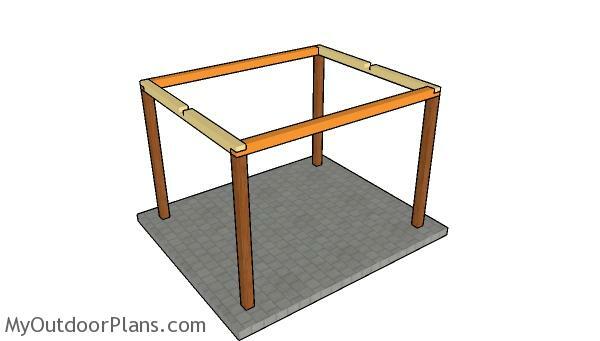 Use 6×6 lumber for the top plates of the pavilion. As you can notice in the plans, you have to make notches to the beams, so you can join then them together. 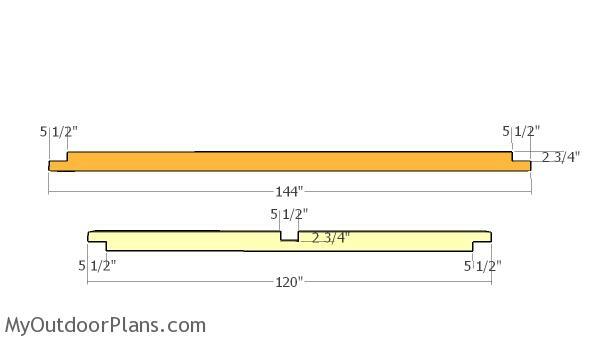 Mark the areas and then make parallel cuts with a circular saw set at a depth of 2 3/4″. Remove the excess material with chisel and smooth the recess with sandpaper. Repeat the process for the front and back top plates of the pavilion. Make the notches and remove the excess. Fit the top rails to the sides, to the front and to the back of the pavilion. Align the edges flush, making sure the corners are square, drill pilot holes and insert 8 1/2″ screws. 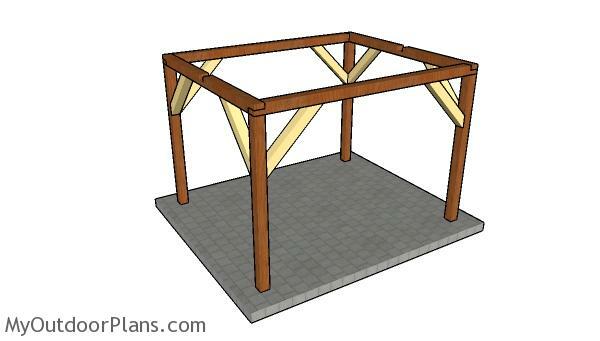 Build the braces for the front and back of the pavilion from 6×6 lumber. 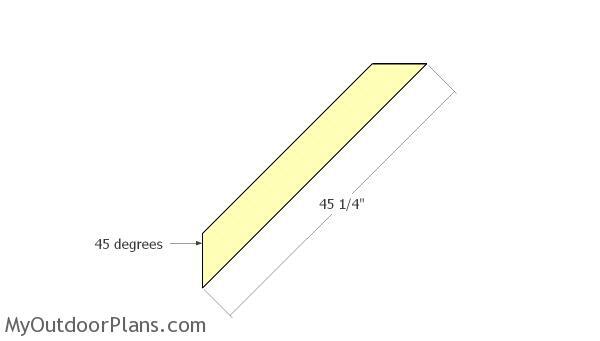 Use a miter saw to make 45 degree cuts to both ends of the braces. Fit the braces to the posts, after you plumb them vertically. Drill pilot holes and insert 5 1/2″ screws to secure the braces into place tightly. Fit the 6×6 supports to the top of the plates. Plumb the supports with a spirit level and then attach the top ridge. Make sure the corners are square and then insert 8 1/2″ screws. Fit the braces to the top ridge. 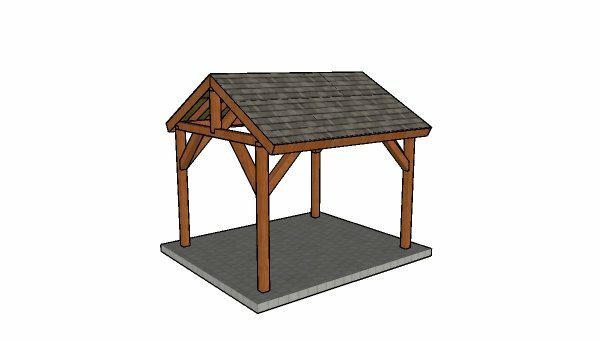 Check out PART 2 of the project to learn how to build the roof. 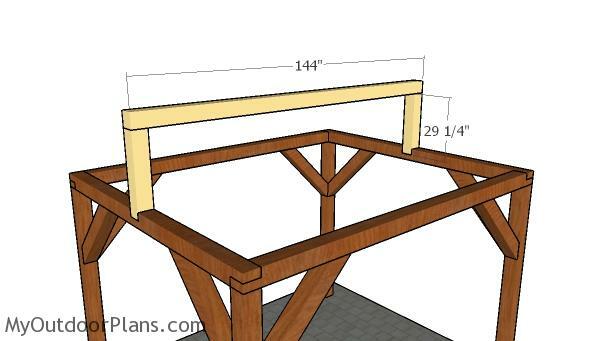 This woodworking project was about 10×12 outdoor pavilion plans free. If you want to see more outdoor plans, check out the rest of our step by step projects and follow the instructions to obtain a professional result.